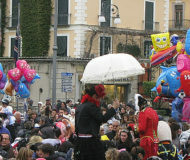 Carnival Events in Sorrento and Amalfi Coast. 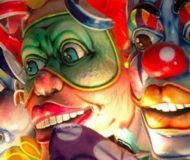 Also this year the streets will be invaded by masks and allegorical floats, the 3rd, 4th, 5th and 10th March 2019. 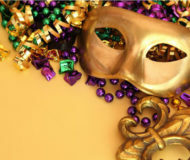 Description: Also this year the streets will be invaded by masks and allegorical floats, the 3rd, 4th, 5th and 10th March 2019. The Municipality of Piano di Sorrento Carnival 2016 will dedicate to the families as it should be. 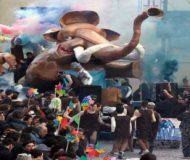 It was not limited to the organization of the usual allegorical floats but, this year, has organized a competition will be held in Villa Fondi. 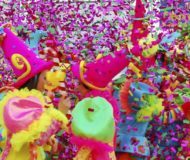 Description: The Municipality of Piano di Sorrento Carnival 2016 will dedicate to the families as it should be. It was not limited to the organization of the usual allegorical floats but, this year, has organized a competition will be held in Villa Fondi. From Sunday, February 7 are scheduled in fact a series of events that will have their day in the conclusion of the February 14, 2016. Description: From Sunday, February 7 are scheduled in fact a series of events that will have their day in the conclusion of the February 14, 2016. Circus street, parades and attractions are organized in Piazza Tasso and Piazza Veniero. Description: Circus street, parades and attractions are organized in Piazza Tasso and Piazza Veniero. In Sorrento, Carnival is celebrated in the streets by day and by night in nightclubs. Description: In Sorrento, Carnival is celebrated in the streets by day and by night in nightclubs.